Cute and stylish, this silver tragus stud is a gorgeous way to update your outfit. This stud features a sparkly red bow that really stands out. It looks fabulous against your skin and shows off your tragus piercing to perfection. 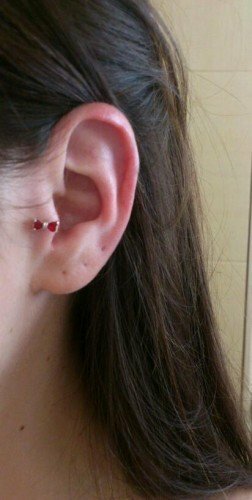 This tragus piercing stud is very comfortable to wear. The bow is 925 silver, while the bar and threaded ball are high quality 316L surgical steel. It is designed for tragus piercings but could also be worn in other ear cartilage piercings or ear lobe piercings.